In celebration of the Apple Store’s tenth birthday, Sensor Tower has shared a look at the most popular apps and games of all time. 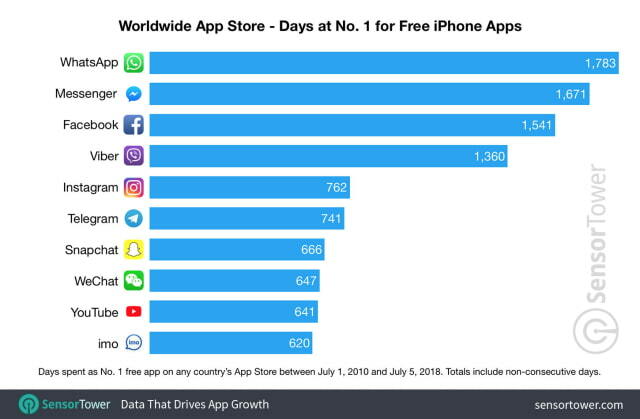 Since it began tracking data in July 2010, thirty thousand apps have reached number one on the App Store charts in at least one country. 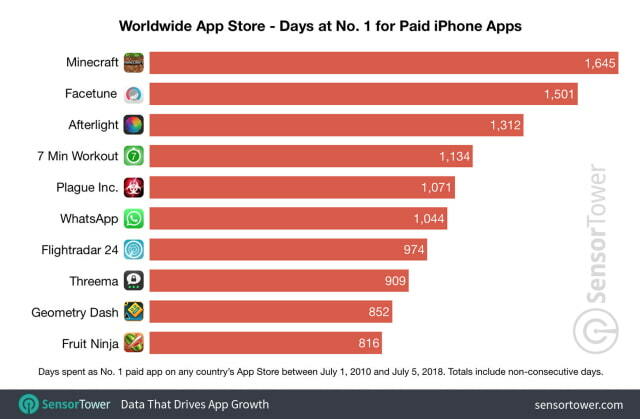 WhatsApp topped the list of free apps, spending 1783 days in the number one spot. Following close behind is Messenger at 1671 days, Facebook at 1541 days, and Viber at 1360 days. Looking at paid iPhone apps, Minecraft comes in first spending 1645 days at number one, followed by Facetune at 1501 days, Afterlight at 1312 days, and 7 Min Workout at 1134 days. Hit the link below for a breakdown of the top apps in the USA and the Top Grossing apps of all time. Next → Next post: تخمین سن واقعی و زمان مرگ افراد!